Grease Zerks pull out often when lubricating equipment. 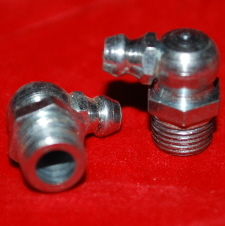 Some manufacturers use a "punch in" type of grease zerk. Quite frankly, that is the cheap method of installing a grease zerk. A good installation will be a threaded application. To the unsuspecting owner of equipment sometimes the grease zerk pulls out and now is the time to make that repair to a threaded type of installation. 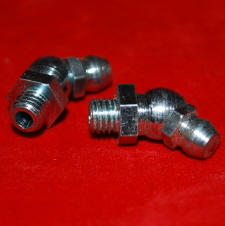 When you buy Grease Zerks, make sure you are buying threaded zerks. The punch in style do appear to be threaded. 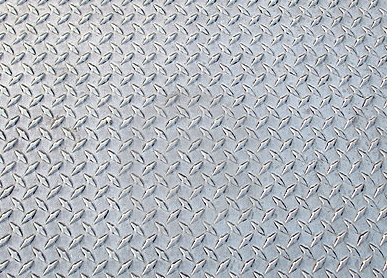 If your supplier does not specifically call out a thread size then be cautious and perhaps look elsewhere for your grease zerks. We sell Grease Zerks for most all needs. 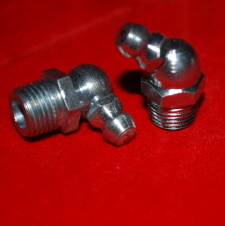 The smaller straight Grease Zerks are sized 1/4-28 and 1/8" pipe for larger applications. If you need a straight or 45 degree or 90 degree angle zerk, all are available from us. Find them for sale lower on this page. 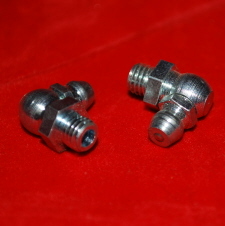 Most of the smaller zerks that do pull out can be repaired using the 1/4-28 threaded Zerk. 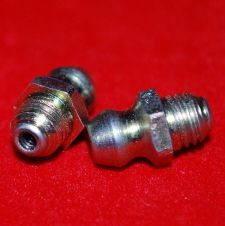 For 1/4-28 grease zerk repairs, use a number 3 drill. If the grease zerk pulled out, it was probably a push in type and drilling out the hole and tapping it to 1/4-28 will make for a better installation. 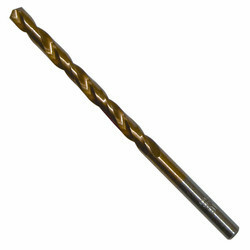 We offer both the Number 3 drill and 1/4-28 tap if you need to buy one or the other. To make the repair first try and determine if your zerk was a punch in type or if it was originally threaded. 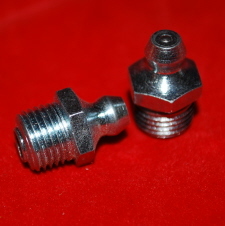 If it was threaded, then you probably should not drill out the hole, but clean up the threads if needed using a 1/4-28 screw or tap. If you determine your hole is not threaded and the zerk was pushed into the hole, then begin the repair process by the drill and tap method. Start by simply drilling out the old hole using the number 3 drill then slowly and carefully tap new threads using the 1/4-28 tap. Be VERY CAREFUL not to over twist the tap when working the new threads. It will take some effort to get the tap started. Once you feel the tap biting into the metal and as the twitsting effort increases then stop of back out SLIGHTLY. Repeat the back and forth (left and right twisting) cutting of threads until the hole is deep enough to receive the threads of the grease zerk. CAUTION-If you over twist the tap, the tap tip may break off and you will have not only a broken tap, but the tip of the tap will be stuck into the hole. About all you can do there is start over with a completely new hole. The tap material is pretty hard and trying to drill out the broken tip may be a worthless effort. Drilling a new hole is most of the time easier to do. Just fill over the tap with some sort of sealant such as silicone or JB Weld or other similar compounds suited for sealing and then start with a new hole. Once you have a suitable hole and it is properly tapped to receive the new grease zerk, install the zerk and don't over tighten the zerk. If some grease leaks out from around the threads, that is alright. Wipe off all excess grease if this happens. Be sure and use the proper grease for your application. Some steel wheels (rims)have grease zerks installed for greasing the inside bearings. If the grease zerk pulls out on wheels, it is very difficult to drill and tap that hole. You may have to be creative making that repair. If unable to make a repair, your only alternative is to hand grease your wheel bearings. This web site has been made available to you for the enhancement of the services we provide to our customers. We've provided a number of resources here to help you resolve GREASE ZERK REPAIR problems, BUY GREASE ZERKS, LEARN HOW TO REPAIR GREASE ZERKS, and suggest improvements to our service of providing GREASE ZERKS for sale online. 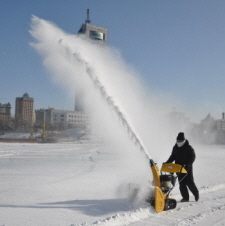 Where can I buy SNOW THROWER PARTS online from mainland USA?